Thanks to all my encouraging and enthusiastic co-Project Emptyers, I was able to push past the disinterest (fear's best disguise) and take another thin slice off the block-o'-clutter this evening. 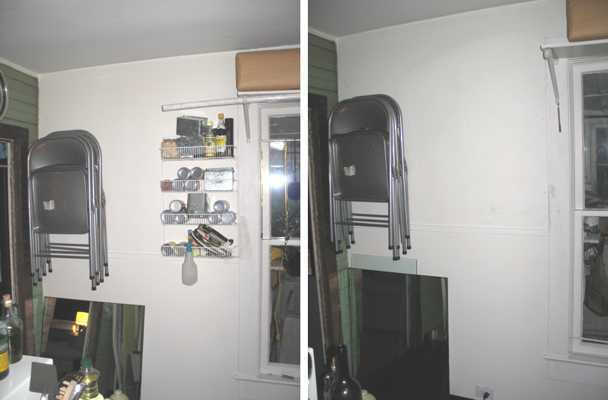 While I was at it, I completely emptied and got rid of a wire rack on my kitchen wall. Since the rack, though junky in itself, contained useful things, emptying it involved finding better places for the stuff I wanted to keep. This, in turn, involved clearing three--count 'em, three kitchen cupboard areas. ...and set aside an unused bit of cookware--a gift from an old friend I lost track of after he became very ill with HIV. Gosh, it's hard to imagine why clearing this innocent cache of kitchen clutter has worn me out so! Yeah. Everything I own has meaning. Even the damn strawberry huller, which I undoubtedly bought with visions in my head of summer parties that never materialized. If the clutter were meaningless, I wouldn't have collected it. The secret, it seems, is to decide which meanings I want defining me, and of those, which cannot be represented any other way than through the possession. Everything else is subject to the giveaway bag--now, or in the next pass. The tally as of tonight: 36 spaces cleared, 44 more to go. What? Something new to vacuum?